by ASPREY, DAVEVIRGIN, J. J. In his midtwenties, Dave Asprey was a successful Silicon Valley multimillionaire. He also weighed 300 pounds, despite the fact that he was doing what doctors recommended: eating 1,800 calories a day and working out 90 minutes a day, six times a week. 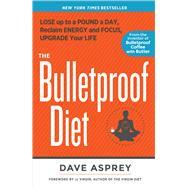 DAVE ASPREY is a Silicon Valley investor and entrepreneur and the man behind Bulletproof® coffee. He is the founder and CEO of The Bulletproof Executive, which reaches more than 1.5 million unique monthly visitors. His top-ranked podcast has nearly 6 million downloads and is being nationally syndicated. He has been featured on the Today show, Nightline, CNN, and in Financial Times, Rolling Stone, Men’s Health, Vogue, Marie Claire, Slate, Forbes, and more. He lives in Victoria, BC and Seattle.